This entry was posted in Blog News News: Politics and tagged blog news Politics: All Posts on May 10, 2013 by Tom Grundy. This entry was posted in Blog and tagged blog on May 10, 2013 by Tom Grundy. 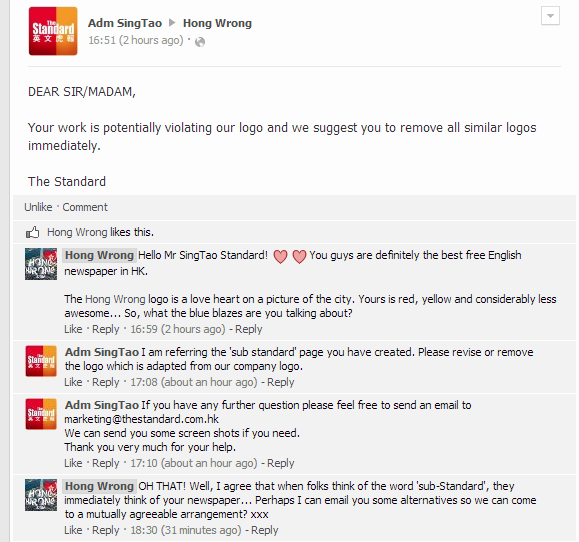 They also planted a fake comment on the blog, supposedly from a random reader claiming to feel ‘confused’ by the logo but actually originating from the Sing Tao Group’s office. Nice try. Anyway, below are ten potential redesigns forwarded to The Standard for their consideration. Feel free to vote on your favourite, leave your comments or have a shot yourself with this high-resolution version (the typeface is ‘impact’). [email protected] are keen to hear from you!